24 Hrs Tulsidas Akhand Ramayan Reading. Starting April 6th Saturday 10am- April 7th Sunday 10am. Please Join in Reading the Ramayan. Slots available every 2 hrs. Everyone will get a chance to offer “ Free bhel patra leaves “ provided by the temple on the biggest shivlingam in the bay Area History ,Don’t miss this chance .It’s once in a Life time opportunity . Temple is open all night March 4th Monday. This is a personal invitation for everyone to come and take divine blessing . Shirdi Sai Darbar & Bay Area Hindu temple , @ 255 San Geronimo Way Sunnyvale , will be doing a Grand Celebration of Maha Shiv Ratri with very powerful Puja, MahaMrituanjaya Mantra chanting, Shiv Tandev, Bhajans and lot more from March 4th Monday 7:00am – March 5th Tuesday 7:00am". All Night OM Namah Shivay Jaap , Rudram and Bhajans . if you or your friends are interested in singing bhajans\rudram chanting\om Namah Shivay Jaap on March 4th midnight , please let us know . Devotees can bring Ganga jal , Rose water , milk,vibhti , sandlewood paste, flower, sugar cane juice, yogurt, vastra/Dhoti for alankar , Prasad for Shiva . we will be doing Alankaram,maha Abhishek, Rudram , Shiv tandav chanting and maha Mangal Aarthi on March 4th Monday from 11pm-1am . Shiva Aarthi every 2 Hrs . 6:00PM-9:30PM : Special bhajans , Kirtan, Alankar, Abhishek, Bhog and Aarthi . For the Special Bhog for Shiva between 11pm-1am : Bring Prasad . Devotees can bring Prasad for Shiva All Day for the Bhog. Volunteers can choose 2 or more Hrs slot . Puja, Aarthi, & Prasad offering. Energized Picture of Maa Saraswati will be given to everyone. Saraswati Puja and Yagna for Education,Knowledge,Music and soft spoken please bring Kids with school books. Dec 18th, Tuesday 5:30 AM. Puja & Archana will be done by priest. Everyone will be allowed to go inside vaikunth Dwar & touch Balaji feets All day 5:30am-9pm , Dec 18th, Tuesday. BayArea HinduTemple part of Shirdi Sai Darbar Invites everyone to come and participate & Take Divine blessings. Let's All come together and be part of Baba 100 Year MahaSamadhi/Punyatithi. All Day Sal Bhandara/SaI Maha Prasad. This is a Personal invitation to all devotees of Bay Area and Beyond to come and participate in this historical Moment. 7:00pm : Rudram & Baba Utsav Murthl Abhishek. 8:55pm : Shlrdl Sal Spiritual Healing Group Prayers for the Prayer Requests. 9:OOpm - 9:30pm : Shirdi Sai Baba Palki Procession. We are looking food sponsors expected crowd minimum 1500-2000 people. invites all devotees of Bay Area and Beyond to come and celebrate Kali Puja & take Divine Blessings . one or many familes can contribute towards the food. Mail Check in the name of "SHIRDI SAI DARBAR" to temple address, 255 San Geronimo Way, Sunnyvale, CA 94085 Paypal / (Details on www.shirdisaidarbar.org). 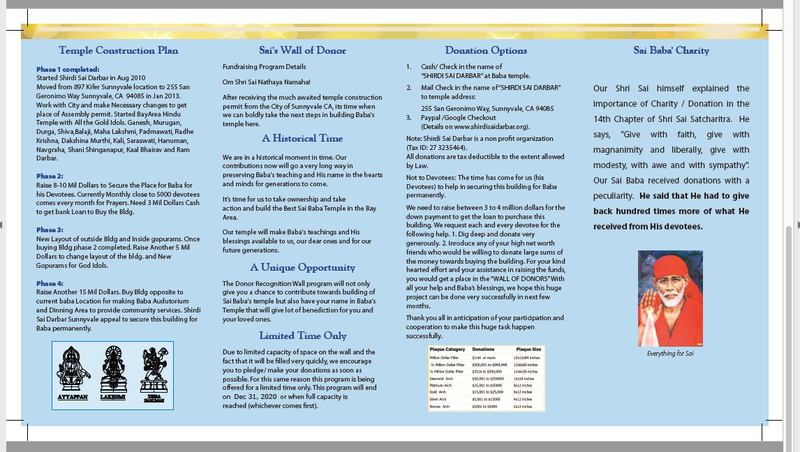 Any donation of $2001 will give your name on Sai' wall of donor. Group Puja, Katha, Rotation of Thali Every Hour First batch starts 4pm. Shirdi Sai Darbar invites each and everyone to come and participate in the Grand event of Devi Navaratri and Durga Puja Celebrations. Wednesday, September 20th 2017 â€“ Saturday, September 30th 2017 At 255 San Geronimo Way Sunnyvale Ca 94085, we will be celebrating Devi Navarathri event from Wednesday, September 20th , 2017 through Saturday, September 30th , 2017. Navarathri represents celebration of Goddess Durga, the manifestation of Deity in the form of Shakti [Energy or Power]. All 9 Days Devi Suprabhatam 9am & Lalitha sahasranama Archana 11am. Daily 9 Days Chandi Path and Havan in the evening. Sep 20th 2017 (Wednesday) Prathama - Shailaputri : Sri Durga Pooja, Lalitha Sahasranama Archana, Aarti, Mahaprasadam Kalash Stapana, chandi Path Parayan all 9 Days. Harida Abhishek. All Grand Sponsorship of $10000 or more per calander year benefits, donor or donorâ€™s family names will be written on Saiâ€™s Wall of Donors . Wednesday, September 20, 2017 to Saturday , September 30, 2017 At Bay Area Hindu temple Part of Shirdi Sai Darbar, Durga Pooja will be celebrated from Wednesday, September 20th, 2017 to Saturday, September 30th, 2017. Sindoor Daan will be on Saturday, September 30, 2017 starting at 6PM . Please plan on participating in all the events with family and friends. Grand Sponsor $2001 or more will have there name inscribed on Saiâ€™s wall of Donor. Everyone is invited to come for Ganesh Stapana and visarjan. Bring Ganesh Favorite modak everyday as a Prasad offering. Sep 3rd Kids Ganesh Puja & Aarthi 8am Bring your kids. Aug 24 - Sep 3rd Program Details. Grand Shri Lord Krishna Janamasthmi Celebration (The Birth of Lord Krishna) August 14 Monday. 09:00pm-10:30pm : Vishnu Shasranamam & Bhajan Kirtan and Hare Rama Hare Krishna chanting. Sankatahara Chaturthi Puja and Abhishek.August 11th Friday, 7pm-7:45pm. Group Poornima Satyanarayana Katha & Puja. August 6th Sunday, 7pm-8pm. Suggested Donation $21, All Puja Items will be provided by Temple. Priest will be available for the Puja. This is a Personal invitation to all devotees of Bay Area and Beyond to come and participate in the Grand Celebration Shri Guru Purnima. Please bring your favorite food forÂ offeringÂ to baba on this Grand Guru purnima Celebration day. 7:00pm - 8:00pm Shirdi Sai Baba Palki . 12:30pm-3:30pm : Shirdi Sai Sangeet cultural programs , sai bhajans and Sai Ram Chanting . 6:25pm : Shirdi Sai Spiritual Healing Group Prayers for the Prayer Requests. 7:15pm - 7:45pm : Shirdi Sai Baba Palki Procession. Group Sai Saptahik Parayan : July 2nd Starting â€“July 8th Ending. Year 2017 To Make this event more Memorable : We will be doing Sai Saptahik Parayan. (à¤¸à¤ªà¥à¤¤à¤¾à¤¹ à¤ªà¤°à¤¾à¤¯à¤£ involves reading the Sai Satcharita in one week) July 2nd Starting â€“July 8th Ending. Shirdi Sai Darbar Grand Celebration Shri Guru Purnima July 8th Saturday 2017 Invitation Card. Sankata haraChaturthi Puja and Abhishek coming up December 6 Wednesday, 7pm - 7:45pm (Everyone can Join). Sita Ram Kalyanam Celebration April 8th Saturday 2017. Sita Ram Kalyanam Festival Celebration coming up April 8th Saturday,10am to 1pm.Kanyadanam,Kankana Dharanam,Mangalya Dharanam,Managala Aarathi,Prasadam for all. Shirdi Sai Baba Shri Ram Navami Celebration April 4th Tuesday 2017. Shri Ram Navami Festival Celebration coming up April 4 Tuesday 7pm - 8:30pm Hanuman Chalisha, 108 names of rama, sai mahima, shri ram ram Ramati, 8:30pm - 9pm Shirdi Sai Baba Pallaki, 4pm - 9:30pm Sai Bhandara/ Maha Prasad. Day 9 (Navami) - April 4th, 2016 (Tuesday) - Rama Navami. Basant Panchami Celebration Feb 1st Wednesday with Saraswati Puja 7PM. Saraswati Puja and Yagna for Education,Knowledge,Music and soft spoken. Please bring kids with school books. For the benefit & convienience of the community. Vaikunth Ekadashi Celebrations Jan 8th, Sunday. Letâ€™s come together and Celebrate Vaikunth Ekadashi, we are looking families in Reciting Vishnu Sahasranam in the morning 8am. Bay Area Hindu Temple part of “shirdi sai darbar” is celebrating New Year 2017 with Balaji ladoo Archana and Aarthi. Dec 31st Saturday - 1001 Ladoo Archana 10:30pmÂ and Mid night Aarthi. Jan 1st Â Special pujas and Archana All Day. Balaji Ladoo Prasad Distribution All Day on Jan 1st. Special Archana Sponsorship for Jan 1st . All are welcome to participate and get the blessings of Shri Shirdi Sai Baba. Bay Area Hindu temple , part of shirdi sai darbar Sunnyvale , will be doing Kali Puja @ 255 San Geronimo Way Sunnyvale ,Ca 94085. This is a personal invitation to Everyone, Please come and Make this Event a Grand success and take Divine Blessings of Maa kali . 07:05 p.m :Â Â Sai Satcharitra Parayana of Chapter 43 & 44. 07:55 p.m :Â Â Shirdi Sai Baba Bhajans. 08:30Â p.m :Â Â Shirdi Sai Baba Palki Procession. Akhand Ramayan celebration Oct 1st Saturday and Oct 2ndÂ Sunday at 255 San Geronimo Way Sunnyvale ca 94085 . AllÂ DevoteesÂ are requested to come and participate in ReadingÂ Akhand Ramayana from oct 1stÂ Â Saturday and oct 2ndÂ Â Sunday. 24 Hrs. Ramayan Parayan (Akhand Ramayana)Â Â will start on Oct 1stÂ SaturdayÂ Morning 10.00 am till NextÂ DayÂ Oct 2ndÂ Â Sunday 12 Noon followed byÂ Maha Naivedyam Prasad. 255 San Geronimo WayÂ SunnyvaleÂ Ca 94085. Itâ€™s a time for all of us to come together and celebrate Shri Ganesha Chathurthi celebration.Everyone is invited to bring kids & Ganesha Bhog â€œ MODAKAâ€ for the Archana and Puja. "Grand Maha Shiv Ratri Celebration March 6th ,Sunday 6am- March 7th Monday 6am"
Bay Area Hindu temple , part of Shirdi Sai Darbar @ 255 San Geronimo Way Sunnyvale , will be doing a Grand Celebration of Maha Shiv Ratri from March 6th , Sunday 6am till March 7th Monday 6am. All Night OM Namah Shivay Jaap , Rudram and Bhajans. 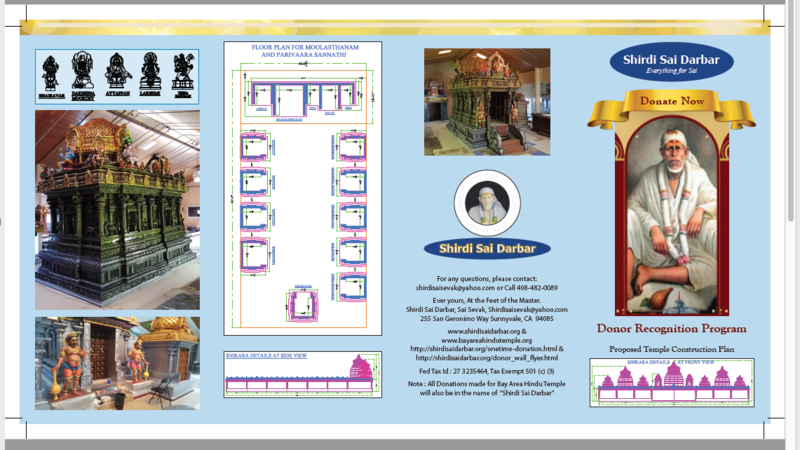 Everyone will get a chance to offer â€œ bhel patra leaves â€œ provided by the temple on the biggest shivlingam in the bay Area History, Donâ€™t miss this chance. Its once in a Life time opportunity. We will be doing Alankaram,maha Abhishek, Rudram , Shiv tandav chanting and maha Mangal Aarthi on March 6th 16th from 11pm - 1am. 6:30 PM - 8:30 PM : Special bhajans, Kirtan, Alankar, Abhishek, Bhog and Aarthi. For the Special Bhog for Shiva between 11pm-1am : Bring Prasad. Devotees can bring Prasad for Shiva All Day for the Bhog. This is life time event. Do not miss it!! Everyone is invited to come and Participate and take divine blessings. Shri Venkateshwara , Padmawati & Maha Lakshami Kolahapur Prana Pratistapana Sep 20th Sunday . Sai Baba Vandanam, Guru Â prarthana, Anugyne, Mahasankalpam, Ganapati Puja;Â Punyahavachanam, Navagraha pooja, Deekshadharana,Â Vaastu Pooja, Mandaparadhana, khanda Deeparadhana, Agni Pratishtapana. Pandita Satkaram,Â Teertha PrasadaÂ . (56 Different varieties of food) MAHA NAIVEDYAMÂ (PRASADAM) to Sai Baba On Aug 1st Saturday. 7:00PM â€“ 8:00PM : Shirdi Sai Baba Palki. This is a Personal invitation to all devotees ,Please bring your favorite food for offering to baba on this Grand Gurupoornima Celebration day. 12:30 PM - 03:30 PM San Sangeet cultural Activity. Sai Sevak ,Shirdi Sai Darbar255 San Geronimo Way Sunnyvale CA. Sai Grand Maha Utsav " June 19th Friday, June 20th Saturday, June 21st Sunday " with Sai Pranprathistha Pooja with free 5000 Baba Murthi Distribution to every one, Shani shingnapur Pranprathistha , sai Palki and lot more . Sai Â Grand Maha Utsav " June 19th Friday, June 20th Saturday, June 21st Sunday "
June 14th Starting â€“June21st Ending. June 21st Sunday Â :Â Baba Pran prathistha and Free Â 5000 Baba Murthi Distribution to EveryoneÂ also 4th Year anniversary celebration. Aarthi , Sai Bhandara/ Maha Â Prasad . Note : if you know any good singers , who can sing baba bhajansÂ and do baba seva by doingÂ 1 hr or 2 hrs Sangeet program either on June 20th saturday or sunday June 21st .Â Pls let us know . This is a personal invitation to all devotees of bay area and beyond to come and celebrate Gudi Padawa, Ugadi, Sai Parayan, Vasanth Navrathri and Baba Ram Navami Celebration from March 20-28th , 2015 and make this event a grand success. .
6:00 PM - 8:00 AM: Special Archana and Pooja. Vasant Navratri 2015 ( March 20-28th). Sai Parayan for harmony and peace at Shirdi Sai Darbar. Baba Ram Navami Celebration with baba palki , Sai Bhandara, Sai Rajya Abhishek , Alankaram, Shirdi Sai Bhajans and Lot more. Sai Sevak, Shirdi Sai Darbar 255 San Geronimo Way Sunnyvale Ca 94085. "Grand Maha Shiv Ratri Celebration Feb 16th, 6am- Feb 17th 6am"
This is a personal invitationÂ for everyone to come and take divine blessingÂ . Bay Area Hindu temple , part of Shirdi Sai DarbarÂ @ 255Â San Geronimo WayÂ Sunnyvale , will be doing a Grand Celebration of Maha Shiv Ratri Â from Â feb 16th , 6am Â tillÂ feb 17th 6am. â€œMaha Shivaratri is the night for spiritual advancement for devotees. It is a great opportunity to connect with the divine energy of Lord Shiva and to invite Him into your life. It is believed that whoever utters the names of Shiva during Shivaratri with pure devotion will be freed from sins and will reach divine communion with the Lord and are blessed with Health ,Wealth and Success ." Everyone will get a chance to offerÂ â€œ bhel patra leaves â€œ provided by theÂ temple on the biggest shivlingam in the bay Area HistoryÂ ,Donâ€™t miss this chance .Its once in a Life time opportunity . Devotees can bring Ganga jal , Rose water , milk,vibhti , sandlewood paste, flower, sugar cane juice, yogurt, Â vastra/Dhoti Â for alankar , Prasad for Shiva . weÂ will be doingÂ Alankaram,maha Abhishek, Rudram , Shiv tandav chanting and maha Mangal AarthiÂ on Feb 16th from 11pm-1am also. For the Special Bhog for ShivaÂ between 11pm-1amÂ : Bring Prasad. Volunteers can choose Â 2 or more Hrs slot .